United States Citizenship and Immigration Services (USCIS) recently announced that it has issued revised Notice of E-Verify Participation and Office of Special Counsel Right to Work posters. The posters are now available to be downloaded in English and Spanish and include clarified language and corrected formatting. Most notably, the new poster now indicates that E-Verify checks data from driver's licenses and identification cards issued by some states. Prior versions of the poster remain acceptable. USCIS also recently released revised E-Verify Memorandums of Understanding (MOUs). New E-verify users will be required to sign one of the two the revised MOUs based upon whether the employer uses web services or browser access. Existing E-Verify users will not be required to execute a revised MOU but effective January 8, 2014, existing users will be required to adhere to the terms of the new MOU applicable to their method of access. 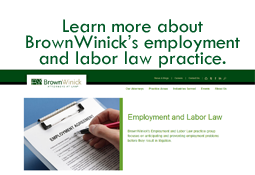 Should you have questions about employment eligibility verification or the E-Verify process, please do not hesitate to contact me or the BrownWinick attorney with whom you work.